With the addition of the 4MATIC all-wheel-drive system for the new 2014 Mercedes-Benz CLS63 AMG and 2014 E63 AMG, Mercedes now has two all-wheel-drive passenger car models available from Mercedes-AMG. Like we reported here yesterday with the new 2014 E63 AMG, Mercedes has also updated the CLS63 AMG performance sedan with a more powerful S-Model. Now the German automaker has two all-wheel-drive passenger car models available from Mercedes-AMG that have the 4MATIC all-wheel-drive system along with the already successful ML63 AMG, GL63 AMG, and G63 AMG SUV's. The all-new 2014 CLA45 AMG will also get the new 4MATIC and will follow later this year. The 2014 CLS63 AMG will come in Coupe, Shooting Brake and S-Model versions. The new 2014 CLS63 AMG and E63 AMG will be featured with 4MATIC and a new S-Model with an increase of 20 percent more power over the AMG performance package that was previously offered as an option. The S-Model will come with the 5.5-liter AMG V8 twin-turbo powerplant with an output of 577 horsepower and 590 lb ft of neck-snapping torque. This will be a bump of 27 horsepower and increase of 59 lb ft of torque over the standard AMG twin-turbo 5.5-liter V8. Power will be transferred to all four wheels via an AMG Speedshift MCT seven-speed automatic transmission. It will feature four modes; "C" (Controlled Efficiency), "S" (Sport), "S+" (Sport plus) and "M" (Manual). The new CLS63 AMG Coupe will sprint from 0-62 mph in a quick 4.2 seconds/4.3 Shooting Brake, when equipped with 4MATIC the Coupe will have a 0-62 mph time of 3.7/3.8 Shooting Brake, and the new S-Model Coupe 4MATIC will be even quicker with a 0-62 launch time of 3.6 seconds/3.7 Shooting Brake. The S-Model versions will have an electronically limited top speed of 186 mph. 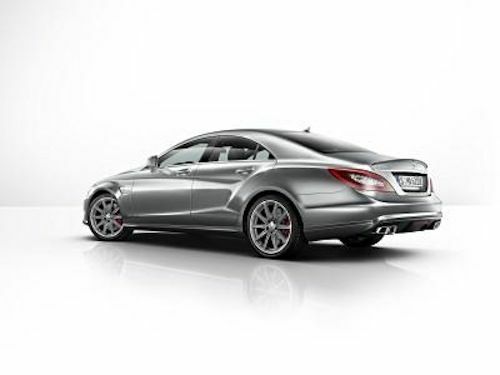 The new 2014 CLS63 AMG S-Model sees Mercedes-AMG going one step further with the addition of a rear-axle differential lock. Mercedes has fitted the differential lock on the rear axle that results in a further increase in traction, ultimately leading to even greater driving dynamics and enhanced driving enjoyment for true driving enthusiasts. The new performance feature will need to be truly experienced on the track to get the full effect. Optional AMG ceramic high-performance brakes are available for those who will be putting additional stress on the S-Model and need the fade-resistant deceleration and shortest possible stopping power. The new CLS63 AMG and E63 AMG S-Models will also feature 10-Spoke AMG Matte Titanium Grey alloy wheels with high-sheen rim flanges, High-gloss black "A-wing", Red Brake Calipers, Contrast stitching on seats, door trim, armrests and center console, Silver seat belts (black interior only), Alcantara steering wheel grips, 'S' badging on trunk and speedometer, AMG Carbon Fiber Engine Cover, Carbon Fiber Exterior Styling Package, Forged twin 5-spoke 19" wheel and a Bang & Olufsen BeoSound AMG High-End Surround-Sound System. Both 2014 CLS63 AMG and E63 AMG performance sedans will come with 4MATIC all-wheel-drive for the first time and the E63 AMG will come standard with AWD in the U.S. market. Both cars will be available in Europe with rear-drive only. The U.S. version E63 AMG and S-Model will be in showrooms this summer. The new 2014 CLS63 AMG and new S-Model will be available in Europe starting in June.